I enjoyed the Academy Awards on Sunday night. The nominations and the winners made sense. On Monday morning, however, I read the rather sad story of a once-celebrated director’s fall from grace. The night before the Oscars, the Golden Raspberry Foundation announced its Razzie awards for the “worst of” filmmaking in 2010. Making a pretty complete sweep was M. Night Shyamalan, who was singled out as worst director of the worst movie, The Last Airbender, based on the worst screenplay, which he wrote. Shyamalan wowed audiences and received six Oscar nominations, including Best Picture and Best Director in 1999, for The Sixth Sense, starring Bruce Willis as a psychiatrist who, in the course of the movie, discovers he was murdered. Willis plays opposite Haley Joel Osment, the boy who famously says, “I see dead people.” The following year, Shyamalan worked with Willis again, and with Samuel L. Jackson, to make Unbreakable, which also received positive reviews. The director’s career has gone downhill from there, both in terms of critical reviews, and in my own reaction to the two other movies of his I have seen. What went wrong? The next Shyamalan movie I saw, The Village, 2004, begins with an engaging premise: the people in an isolated 19th century village live in fear of a race of beasts that roam the surrounding forest. After a child dies, Lucius Hunt (Joaquin Phoenix) asks the village elders for permission to pass through the forest to “the towns” for medical supplies, but his request is denied. The beasts paint the doors of village cabins with blood as a threat and warning after Lucius makes a short foray into the forest. The beautiful Ivy Walker (Bryce Dallas Howard), blind daughter of the chief elder, becomes engaged to Lucius. When he is stabbed by a rival, the prognosis is dire: Lucius will die without medicine. 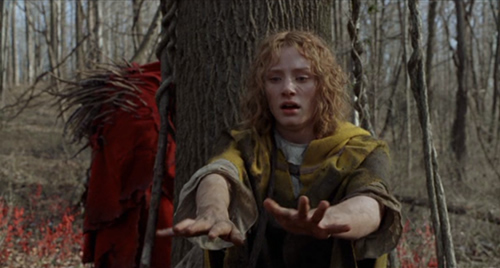 Ivy begs her father, Edward Walker (John Hurt), to allow her to go to the towns. He agrees, against the wishes of the other elders. Before she leaves, he reveals a secret: the monsters do not exist. They are a fabrication created by the elders to frighten children so they will not enter the forest. Yet when Ivy ventures into the woods alone, a beast attacks her. So far so good. We are well into the movie and gripping our seats, but then, Shyamalan’s penchant for twists runs amok. Ivy manages to escape the beast, who turns out to be the boy who had stabbed Lucas, wearing a monster suit. Ivy comes to a concrete wall, finds a handy ladder nearby, climbs up and over and winds up at the edge of a highway where a ranger in an SUV picks her up, looks at the list of needed medicine her father had written out, gets it for her (they have a bit of trouble), then helps her back over the wall with a warning to be careful. We learn that the village elders are actually refugees from the culture of violence in America, who bet their lives and livelihoods on the grand experiment of trying to raise a peaceful generation in a peaceful agrarian culture. You can check out the theme and logic behind the events at http://en.wikipedia.org/wiki/The_Village_(2004_film), but from my perspective, these elements were buried in a flawed story, one that would never ever, ever, ever, ever – as in, no way – have gotten past the the two writing critique groups I sit with. In other words, not even the least experienced among us would get away with the plot flaws that pepper Shyamalan’s screenplay. That, I believe, is the key to the disappointing trend of this director’s movies. He tries to do it all – write the screenplay and direct the movie, and his early success must have isolated him from, or deafened him to, the collaborative voices that could have asked questions that should have been posed before the first scene was shot. Questions like why Ivy’s father, a seemingly decent and caring man, would let his blind daughter brave the woods and the modern world alone? And if simple antibiotics could save his future son-in-law, the town golden boy, why wouldn’t he just go out and get some. And no matter how large his personal fortunre, (see the wikipedia page), who on earth is going to believe he could have bought secrecy for an entire village? We’re supposed to believe that Homeland Security hasn’t studied the satellite photos in a post 9/11 world? Contemplating this set of Razzies, I was struck with a deep appreciation for the members of my critique groups and all of their comments – those that seem pertinent and those that don’t. They help keep me honest. These are not the “discouraging words” I mentioned in my previous post. Discouraging words sound like this: You can’t. Good criticism from people who value each other’s efforts sounds very different: You can, and here are some ideas on how to proceed. This entry was posted in Movies, Writing and tagged movies, postaweek2011, screenwriting. Bookmark the permalink. Much has been written about how writing is a lonely, solitary business, but you are absolutely right, Morgan. Good writing cannot be lonely or solitary. We need the help, prodding, encouragement, feeding, and watering of others. Good critique partners are the greatest blessing. Thanks for being one of mine.